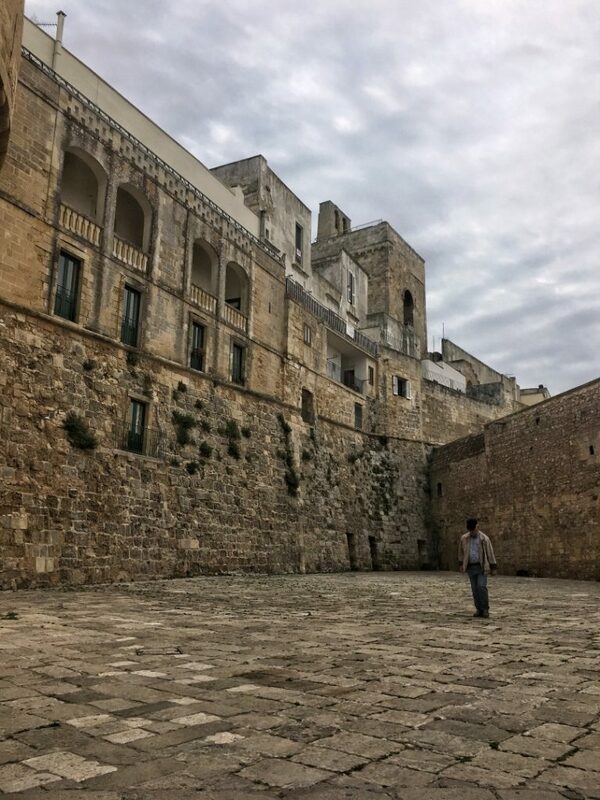 As promised in the first part of this post, today I will cover briefly my last four days in Puglia, stopping and thinking back a little to all the places I have enjoyed during this wonderful trip. As I am writing the introduction to this post I cannot help but think back to all the trips I took in 2017. Since today is the 30th of December my mind moves back and forth between places I visited in 2017 and my plans for 2018. Almost 6 months after my trip to this special part of Italy I still smile thinking of the things I have seen, people I met and the food I enjoyed during my time there. After a hard year I am grateful for being able to write these lines and I am also grateful for the chance I had in visiting Puglia and all the other beautiful destinations I traveled to in 2017. Before starting this article I would like to wish you all a Happy New Year, a 2018 filled with health, joy, plenty of smiles and lots of trips. I wish that you all check at least one destination from your “must see” list and set more objectives for the time to come. And now for the last part of the article: Days 3 to 6. Day 3:From the start I must tell you that this was the hardest day by far. I got up real early and drove all the way to Otranto, the first stop of that day’s journey. More than 400 kilometers drove that day but I can tell you from the start it was worth it. Otranto, my first stop, is a small little place with a lovely terrace that gets featured quite often on many photos from around the world. Its empty little streets on that cloudy day made for one of the nicest ways to start a day. I left my car at a paid parking lot and went afoot for about 600 meters before entering the main gate and starting to walk the little streets. While this place may seem a bit under the places I saw on the second day it deserves a visit. The small castle, the terrace, the views of the quiet sea all make for a great destination. 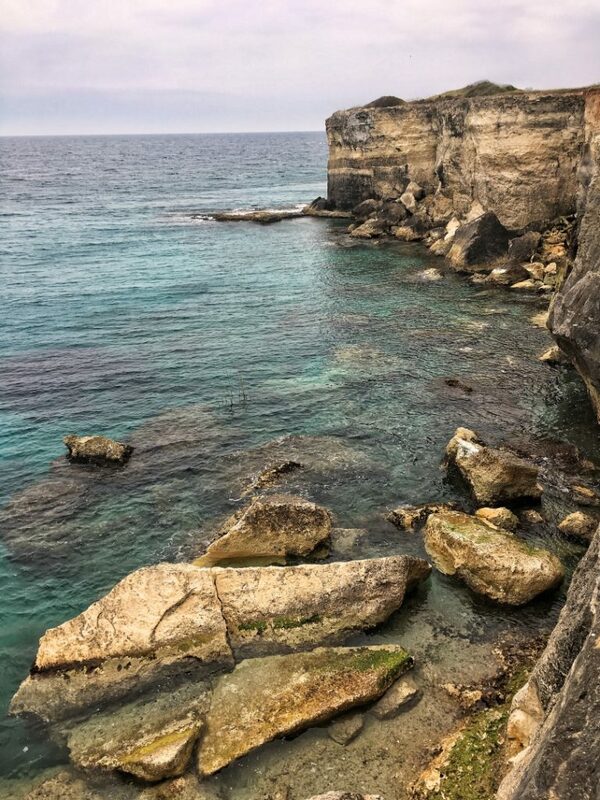 My next stop was Torre dell’ Orso and many people would say “rocks?” but they are not just rocks. They are a magnificent site from above. The twin rock sisters on that blue water, the water still, just small ripples from time to time. And quiet. From above standing there alone, just a couple of tourists and their dog I felt calm. I left my car on a dusty road and walked thru a small forest to reach the cliff from above. From there I took my pictures and gazed at the sea for a while. Because I visited this place in May and on a cloudy day the beach, the cliff, everything was empty of people. It was quiet and it was beautiful. I walked around the cliff and took photos from many angles, looking around me, admiring the color of the water and how the sisters stood there. From that place I drove a little to Grotta della Poesia and in this place there are two things that you must see. 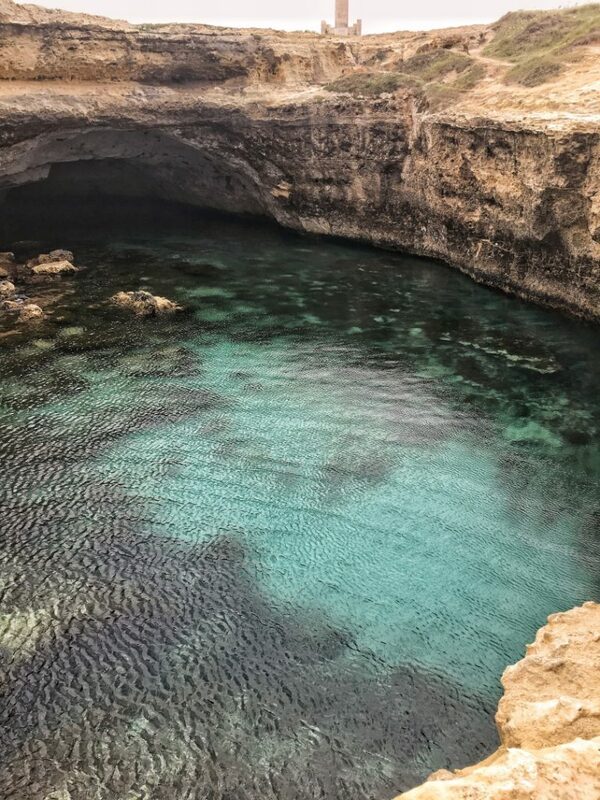 One is the Grotta which is beautiful. A few metres from the sea, this place so quiet and colored, the little narrow steps leading down to the rocks where you can sit and admire it. 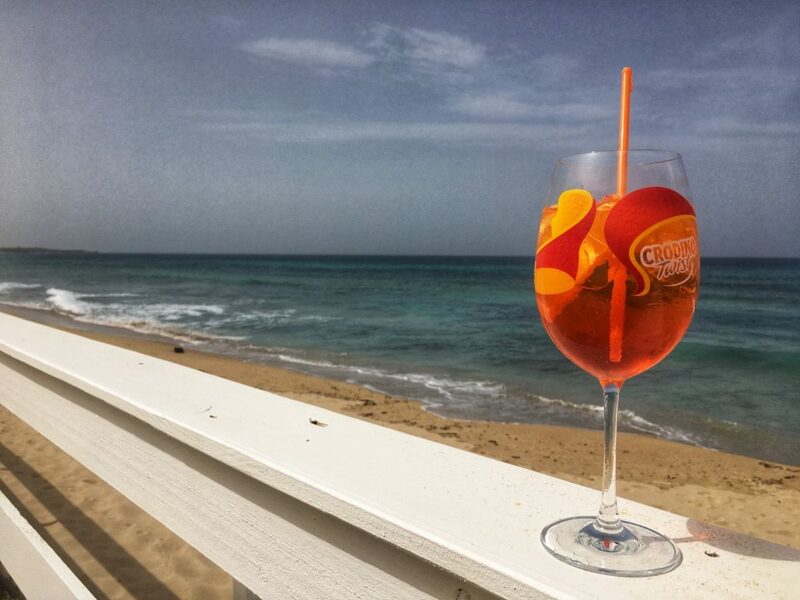 Between the road and the sea, the Grotta is a place of calm, a place of beauty, a place of silence. Just before getting to the Grotta there is a small rock stairs leading to a narrow place from where you can observe the sea. It is little but when you sit there, all you see around is water so it is worth climbing down those few steps. The next stop well it is not a must but I am happy I took it. I shot 2 pictures here only but I think one of them is one of my favorite photos ever. 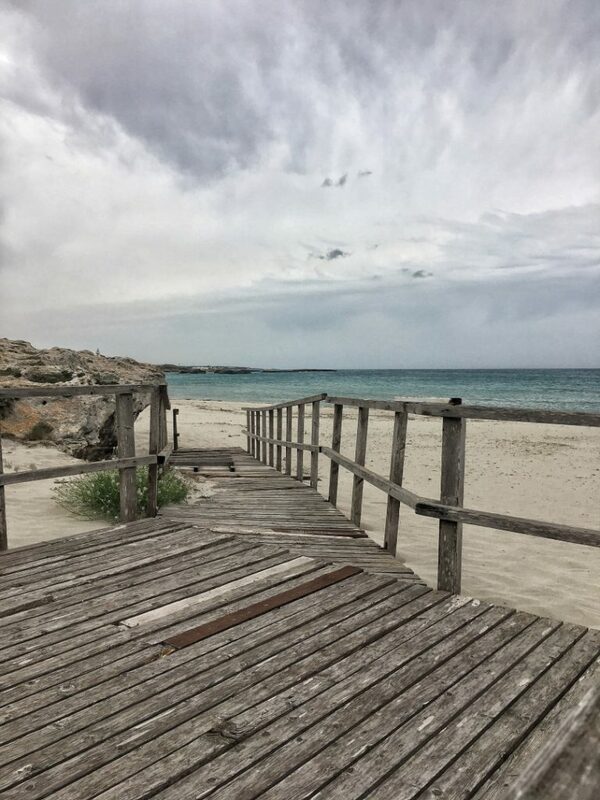 The small wooden structure, the empty beach, the soft sand, the grey cloudy skies and the sea. Sometimes it just can’t get any better than this. Walking on that empty beach, resting my hands on the wooden structure, looking at the sea, all in a silence so deep you could hear your own breath. Only two cars passed as I stood there and woke me up from my thoughts. 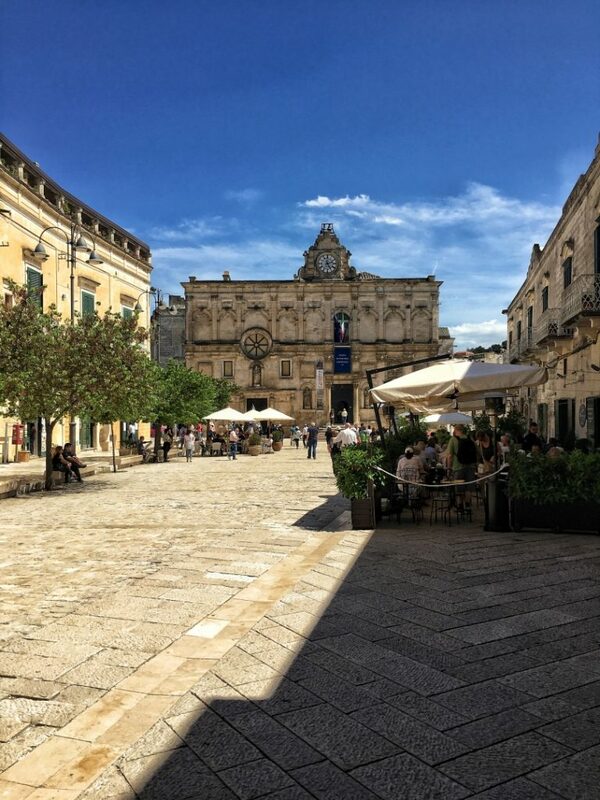 After all that peace and quiet came Lecce and after parking close to Porta Napoli I walked thru the maze of streets that is the old part of Lecce and started gazing at the buildings. 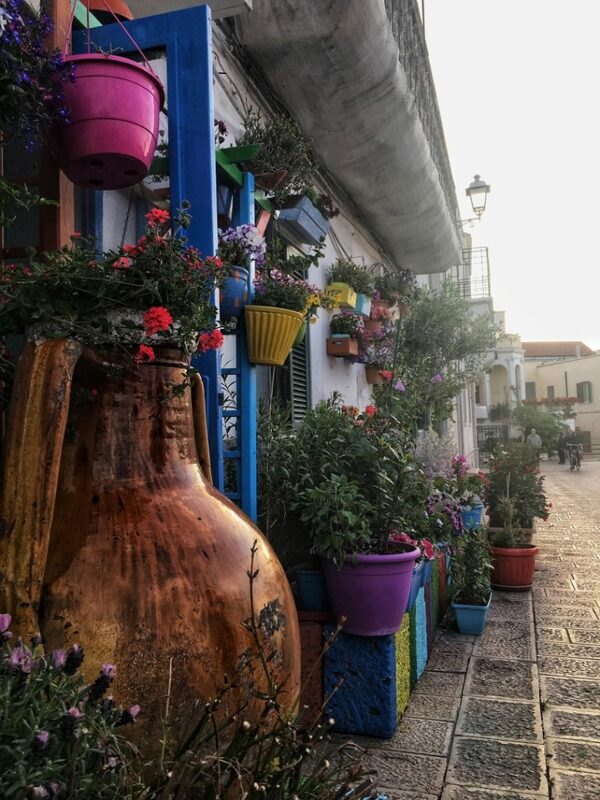 After a great meal at a small restaurant just outside the old town I got back to wandering on the streets and admiring the history behind them. Now many people spend a day in Lecce but from my experience you can easily go thru it in four to five hours depending on how fast you walk. And for me that was the perfect way to end the day. A big city with lots of people, with full restaurants and shops after a morning of quiet and peace. Day 4: Now this is a day long waited. A day to enjoy the May sun in two places. My first stop on that day was a small place called San Vito. Not many people know of it since it is so close to Poglinano and it gets easily overshadowed by it. But if you have a car it really deserves a small stop. The bay filled with fishing boats, the waves crashing on the shores, the Benedictine Abbey guarding the bay, it all adds up to a beautiful, peaceful place that will stay with you for a long time. Next stop, the famous Poglinano a Mare, this place being in my opinion the other famous Puglia sight next to Alberobello. Here as well I found a paid parking lot and headed towards Lama Monachile. That is the place that everybody looks for when coming here and from my pictures I hope you see why. This place is truly incredible. And no matter how many pictures you see you must see it for yourself to truly grasp its beauty. Up above houses with small windows overseeing this place, people on the street behind stopping for pictures, the constant hit and sound of the waves, the small grotto to the left giving you another lovely look, the rocky beach. As I sat there, getting a tan and relaxing I watched the waves hitting the rocks and lost track of time. Being May it was not yet a perfect weather for swimming and tanning but nonetheless there were quite a few people there sitting and admiring the view. Those houses high up there, inhabited, the people stopping to take pictures, the cliff, the sea, everything this place is, is just beautiful. This was the time I felt sorry that I couldn’t spend the rest of the day here, relaxing and unwinding. But I had other plans for that day so I got back to the car and drove to Grotte di Castellana. Now, I must confess, this place wasn’t upon my original list but I am glad I stopped here. For a small fee you can take a 40-50 minutes guided tour thru the caves and I can assure you it is an impressive sight. 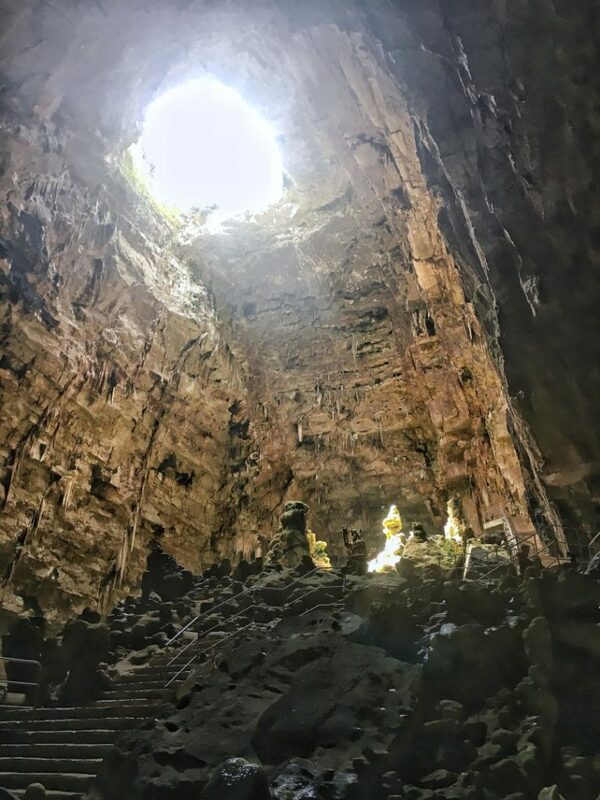 Just make sure you’re packing something a bit warmer since it can be quite a shock after enjoying the sun outside to go down for more than 60 meters deep. Other than that I was lucky to have a very nice guide(the tour was taken in English) that entertained us along this trip with numerous details, dates, events and jokes. Last stop that day, before returning the car back was in Monopoli where I cruised the streets for a little time and ending up at Lido Bambu for a well-deserved stay on the beach enjoying an Aperol and some aperitifs. Day 5: Now this was the first day without the car and I must be honest looking back I truly regret not paying for the car for another day or two. I had scheduled Matera for that day and the only minus of that trip was the length of the journey by train. 1:40 hours/way so if you chose to go by train that’s not much else you can cram in that day. Regarding Matera all I can say is that this place is a must see. The incredible amount of stone, how it is all built and crammed in that place, that’s something many pictures fail to capture. The small patches of flowers contrasting strongly with all that stone, the stairs and the ups and downs of the roads must be seen to fully understand this place. A simple warning here: from my experience Matera feels hotter especially on sunny days. So a good idea would be to grab a bottle of water and very comfortable shoes before getting there. You will have to walk a lot and I can’t tell you from the start bad sneakers will ruin the experience for you. In a later post I will tell you all about a little restaurant that I loved here and consider it to be one of the nicest surprises of the day. 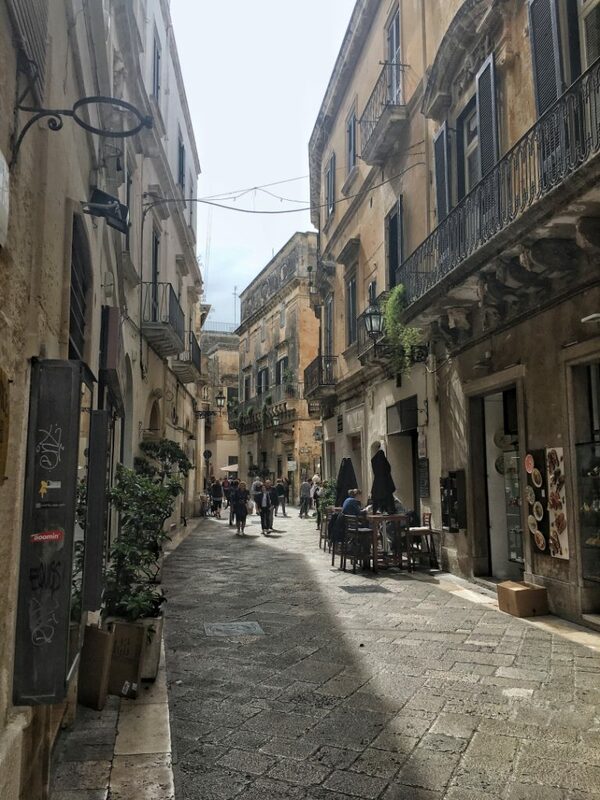 Day 6 meant relaxing for me so I stayed in Bari, enjoyed the sun, ate some focaccia, got another great yogurt(addicted to them and I will write a post about the place that sold them soon) and just took my time to relax. Yes, I could have tried to catch a train, change a bus and see one more thing but there is a need to relax and unwind during each trip and that was day 6 for me. A time to let my feet rest and to just walk aimlessly thru the old town of Bari. Before ending this piece I must tell you that Puglia is not about famous landmarks or must see things. 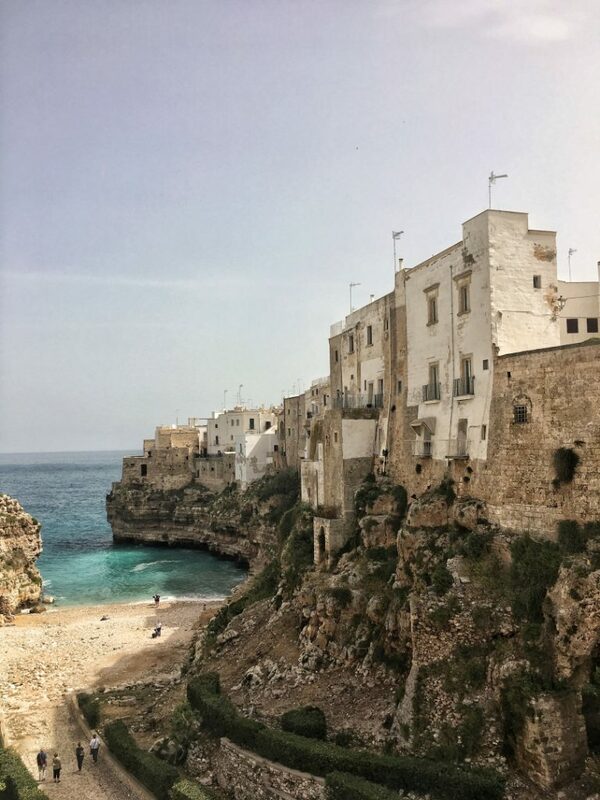 Puglia is about feeling the place, about feeling local, about enjoying places that are not yet commercial. 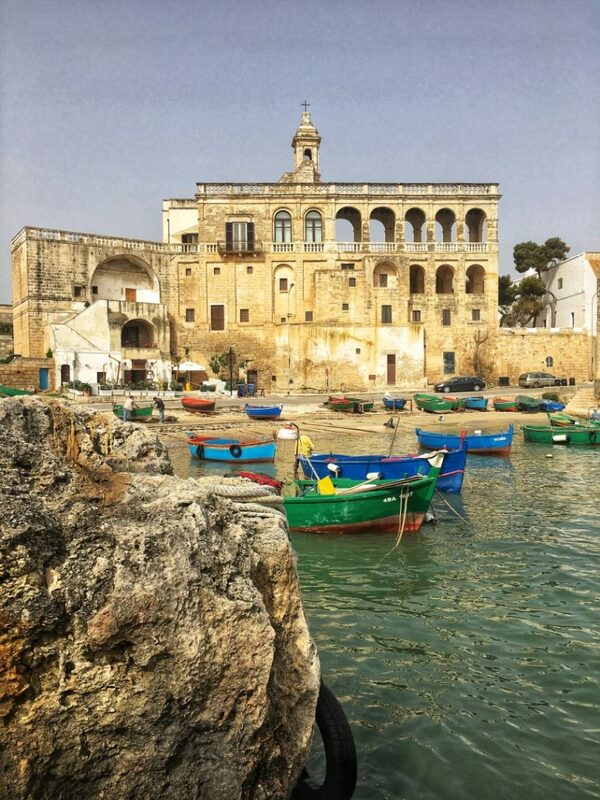 Puglia is about things that stay in your heart long after leaving there.